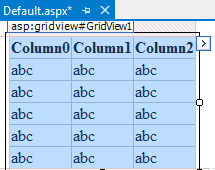 The GridView data grid control is probably the most popular and flexible data grid control in the ASP.NET arsenal. In this tutorial we will create a new GridView data grid on a web form. 2. Click on the "Toolbox" tab, then expand the "Data" node, then drag the "GridView" data control to the Design surface. The Design Surface is the big window in the middle of Visual Studio. 4. Click on the ">" button next to SqlDataSource1 control, then select "Configure Data Source"
6. 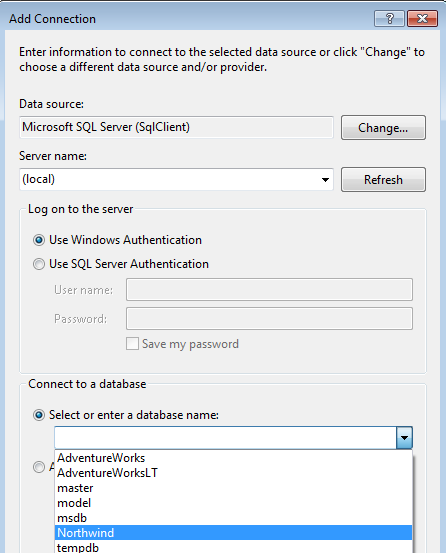 Select your "Server name", SQL Server should pick up your database server automatically if it's on a local machine, but if it doesn't type in (local) in the "Server name" field. 9. Click "Next", leave the checkbox check for the option "Yes, save this connection as:", "NorthwindConnectionString"
11. 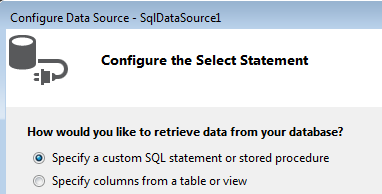 On the "Configure the Select Statement" window select "Specify a custom SQL statement or stored procedure"
13. Click on the "Query Builder" button"
14. 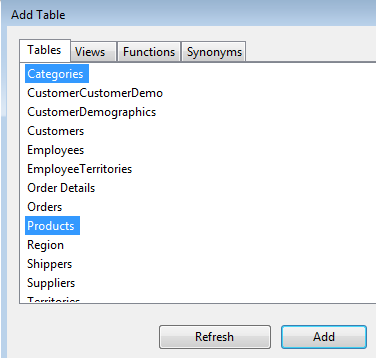 On the "Add Table" window select the "Categories" and "Products" table and then click "Add", then click "Close"
20. Click on the ">" button next to the GridView1 control, and for the "Choose Data Source" dropdown list chose "SqlDataSource1"
21. Right-click on the "Default.aspx" file then select "Set as Start Page"
22. Press F5 to run the page, the GridView will be displayed on the browser page.